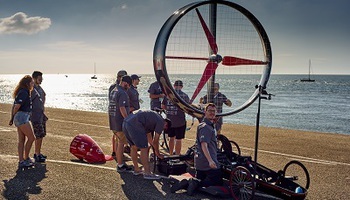 Once every year, international teams of students compete to become world champion in the development and realization of so-called “headwind vehicles”. 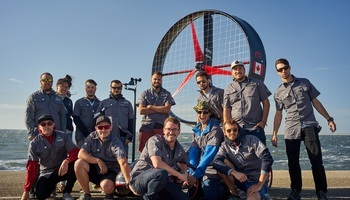 At the 2016 Aeolus Race, held in the coastal Dutch town of Den Helder, the Canadian “Chinook ETS” team from the École de technologie supérieure (ÉTS) (Montreal University of Technology), supported by SAERTEX USA, was one of the participants. Since 2009, Chinook ETS has been developing and building a vehicle that is able to take advantage of opposing and ambient winds as a source of power and propulsion. SAERTEX USA supports École de technologie supérieureby providing carbon non-crimp fabrics. Equipped with a fully mechanical drive, the Chinook vehicle gets its energy exclusively by utilizing opposing and ambient winds. The torque generated by the wind turbine is transferred to the main transmission using numerous subsidiary transmissions and drive shafts which multiply the power that is transferred to the wheels. Mechanical systems such as mast rotation, blade pitch, and gear shifting are controlled and monitored electronically to ensure the best possible performance. The data is transmitted via a CAN bus network to the Chinook Black Box, the electronic brain of the vehicle. All data can be monitored from the ground station using a wireless network. The weight of the vehicle plays an essential role in this project in order to achieve the best possible energy efficiency and performance. Many hours of research and development have flowed into this project. In order to constantly improve, the team used the knowledge acquired from previous projects and optimized every aspect of the vehicle. 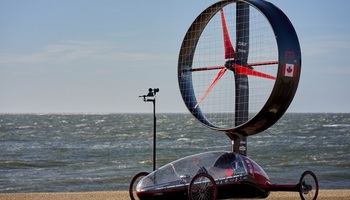 The mechanical systems had already been augmented in the previous (2015) model in order to perform better under strong wind conditions. In addition, all the electronic systems were tested, simplified and designed to be more efficient. Using the ultra-lightweight non-crimp-fabrics from SAERTEX for the structure of the diffuser, body and fairings resulted in considerable weight savings with better mechanical characteristics such as an improved rigidity. It also enabled an aerodynamic design that is twice as more efficient. Every year, several competitions take place in which only vehicles driven by opposing headwinds can take part. The ETS team recorded its fastest race with the previous model, the Chinook 5, at the Drag Race Event Cup. Due to the poor wind conditions on the first day of the 2016 Aeolus Race, the team “only” took second place in the overall ranking. The Chinook 6 dominated on the last day of the race, when powerful headwinds of up to 45 km/h prevailed. Reaching a top speed of 40 km/h the vehicle recorded its fastest race, attaining an efficiency of 88%. Dans la construction navale, les produits SAERTEX contribuent à améliorer le bilan énergétique des bateaux à voile et à moteur.